It always amazes me every time I visit Kuala Lumpur, which is at least once a year, how much the skyline has changed yet again. Skyscrapers spring up like mushrooms in the Malaysian capital. With such an impressive, ever-changing skyline, it’s a jostle to get a great view. 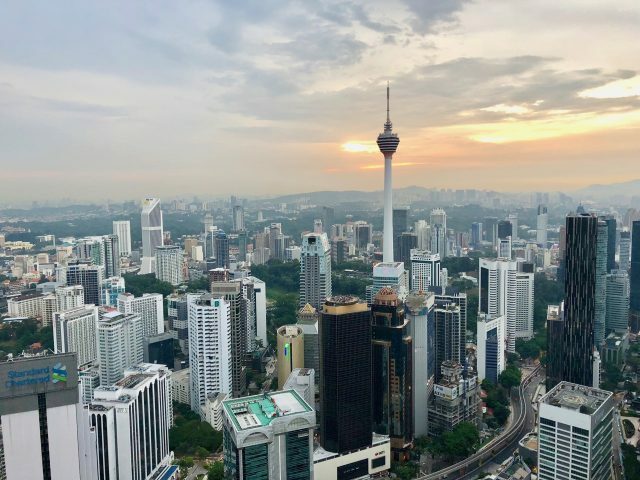 There are many rooftop bars and restaurants to enjoy a panoramic view of the Kuala Lumpur skyline, and like the constantly changing skyline itself, there’s always a new place with yet a better view. On a recent trip, my sister took me to Vertigo bar on the rooftop of the Banyan Tree Hotel. 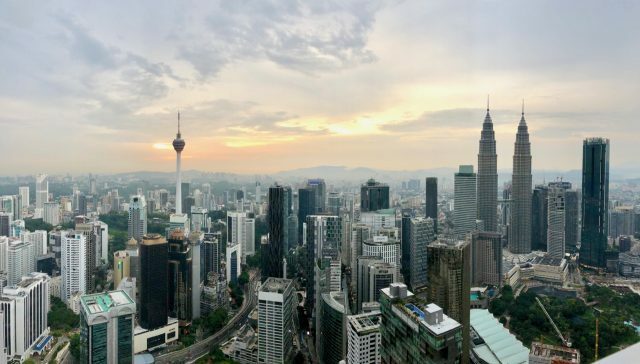 The panoramic view of Kuala Lumpur from Vertigo rooftop bar. We got there before sunset and as soon as I stepped out onto the terrace, I was in awe of the view! The iconic Petronas twin towers (at 452 meters, still the world’s tallest twin towers) stood proudly before us. I looked around and quickly spotted all the other familiar landmarks. We found a comfortable corner to sit and ordered our drinks – I must say, the staff were friendly but service was a tad slow, and the drinks were pricey, even for KL standards. We also ordered some snacks which sounded good on the menu but were, in fact, pretty mediocre. I told myself that we were there for the view and THAT certainly didn’t disappoint! 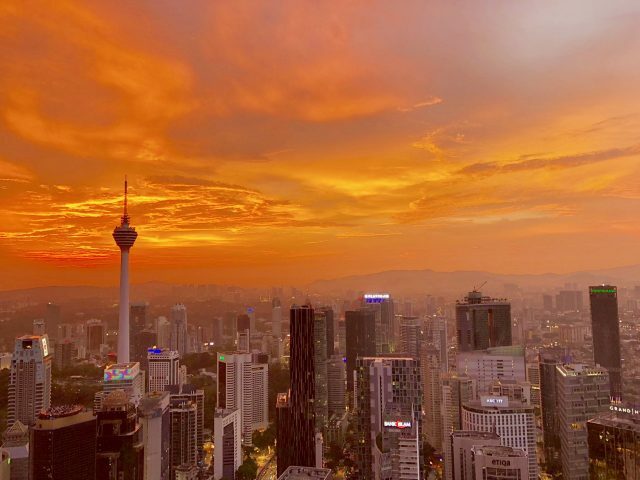 Vertigo doesn’t have a full 360-degree view unlike other popular spots such as the KL Tower and the Grand Hyatt Hotel but it does offer an alfresco terrace to enjoy the views and the breeze. The Petronas twin towers. The tower in the far right is the new Four Seasons Hotel Kuala Lumpur. The view towards KL Tower. The 106-storey Exchange 106 tower under construction. This tower is already the tallest in Southeast Asia. When completed, it will be 492 meters tall. It was a very cloudy day so I wasn’t expecting much in terms of the sunset but as the sun retreated below the horizon, the colours changed gradually, and then dramatically. The result was a surreal urban landscape, with a plethora of towers framed by a blazing red sky! The lights from the surrounding buildings, streets and traffic below looked like a sea of shimmering gems. It was perhaps the most incredible view of Kuala Lumpur I’d ever seen! 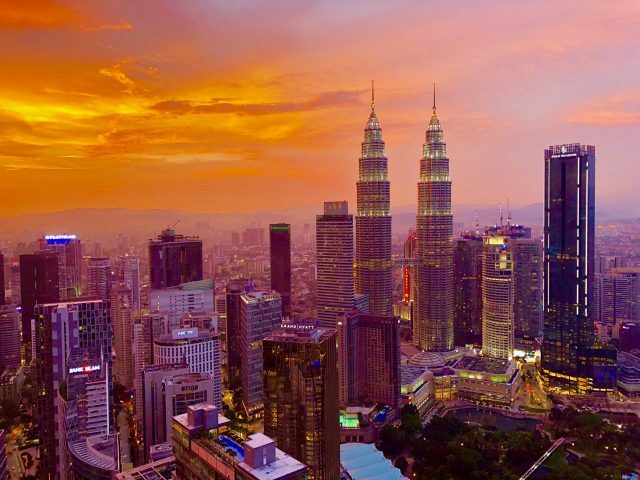 The Petronas twin towers as the lights came on and the sky turned orange. KL Tower view at sunset. 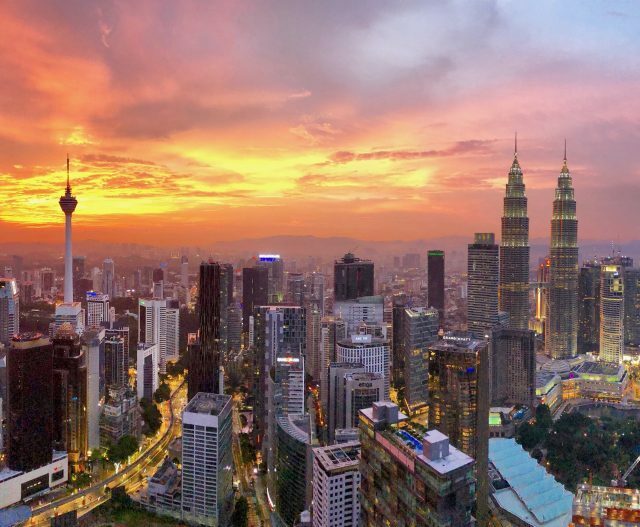 Panoramic view of the Kuala Lumpur skyline at sunset. Thanks James! KL’s skyline sure gets more impressive with each passing year. Two 500m+ towers are under construction right now. It’s incredible! Some great views there! I was back this month and was also impressed by how much the city is growing. It’s on track to have the best skyline in Southeast Asia. I love the Panorama 51 in Toronto, especially at sunset time. And also Eiffel Tower’s restaurant in Paris! The views sure were breathtaking! And I was so lucky with the sunset. The views are breathtaking! Absolutely beautiful!